Our Transportation Department is committed to safely transporting students to and from school and various school events. 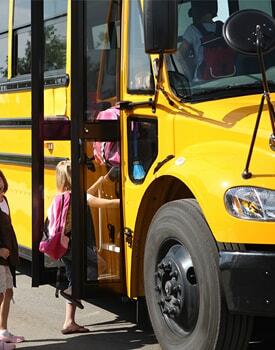 Student security is our top priority, so we expect all students to follow the bus rules we have established to give every rider a safe and positive bus riding experience. These rules apply to daily riders, occasional riders, and field trip participants. Please take some time to review the rules below with your child. We appreciate your support! Everyone has an assigned seat. No switching! Keep all parts of your body inside the bus (including your hands). Keep backs and bottoms on the seat at all times. Keep body parts and personal items out of the aisle. Do not talk at the railroad crossings. Avoid loud talking or yelling. Do not bring gum, toys, or electronics on the bus. Find all your bus information here.